Despite the promise of an increasingly educated population of young people, the Middle East’s “youth bulge” generates pressure on education systems, labor markets, health care, natural resources and infrastructure. In this context, and with constrained public and private resources, traditional development frameworks in the Middle East are proving inadequate and are in need of transformation. 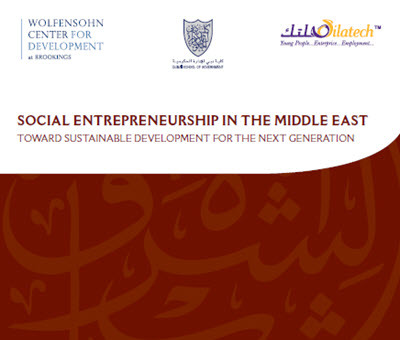 Within the complex ecosystem of domestic governments, international donors, private businesses and individual philanthropists, the emerging model of social entrepreneurship offers potential as being one model to address the multi-sectoral challenges young people face in the Middle East. Innovation that can be adapted and “scaled up” beyond the local context: It is by pioneering ideas that can be applied at a larger scale that social entrepreneurship is able to contribute to systemic and path-breaking change. Leveraged nonprofits capitalize on the interest of a variety of stakeholders to operate and to secure ongoing support based on a diversified portfolio of funding. Enterprising nonprofits have a self-financing component contributing to the organization’s sustainability. Hybrid enterprises combine aspects of the for-profit and nonprofit legal models, either through an innovative legal structure or by using a for-profit subsidiary to support the social activities of the nonprofit. Social businesses are those that can demonstrate market-level financial performance and competitiveness while expressing an equal or greater commitment to a social aim. Several trends in the region point to the important role that social entrepreneurship can play in capitalizing on the youth bulge, including an increased sense of social commitment expressed by a growing youth population, the incremental yet increasing ease of doing business in many of the countries, and the growing strategic orientation that is being adopted by the region’s philanthropic donors. Together, these represent promising trends for social entrepreneurs seeking talent and capital to start their own enterprises. Yet only with a conducive institutional environment can social entrepreneurship grow into a transformative tool in the field of youth economic development.